There are so many gorgeous woven and yarn wall hangings out there on Etsy and at craft markets, but I wanted to try making my own. I came across this amazing tutorial from Homey Oh My and tried my hand at it. 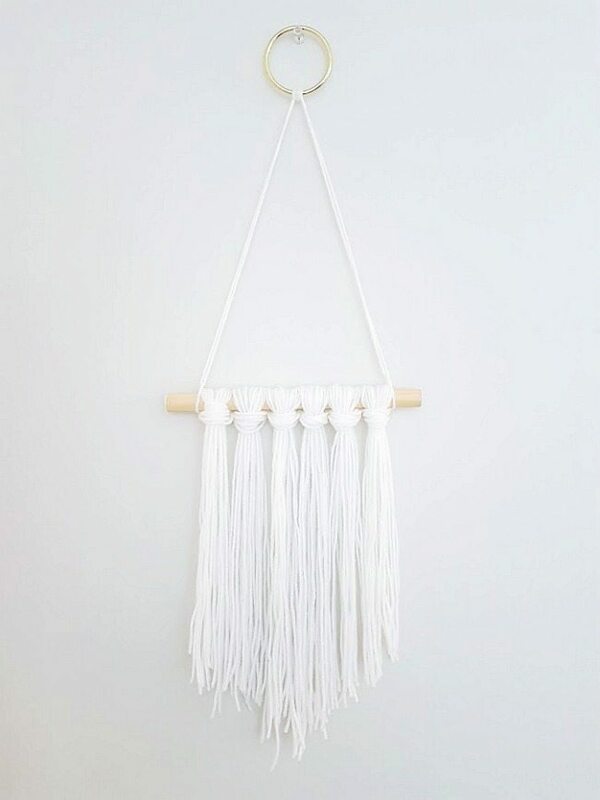 Who knew making a DIY wall hanging would be so easy! 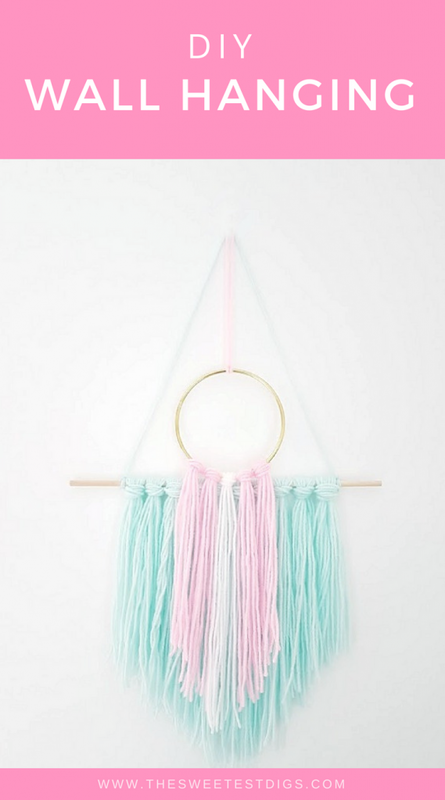 I promise you’ll be able to whip out this DIY wall hanging beauty in less than 15 minutes. No complicated weaving required. Yarn. Choose yarn in whatever colour you want! The chunkier the yarn is, the thicker your DIY wall hanging hanging will look. Dowel. You can go with a thin 1/4 inch dowel or a thicker 3/4 inch dowel – it depends on your aesthetic. The black hanging I did is on a thicker piece, while the mint one in the photos below uses a thin piece. Make sure the dowel is at least 12 inches long. Metal Rings. 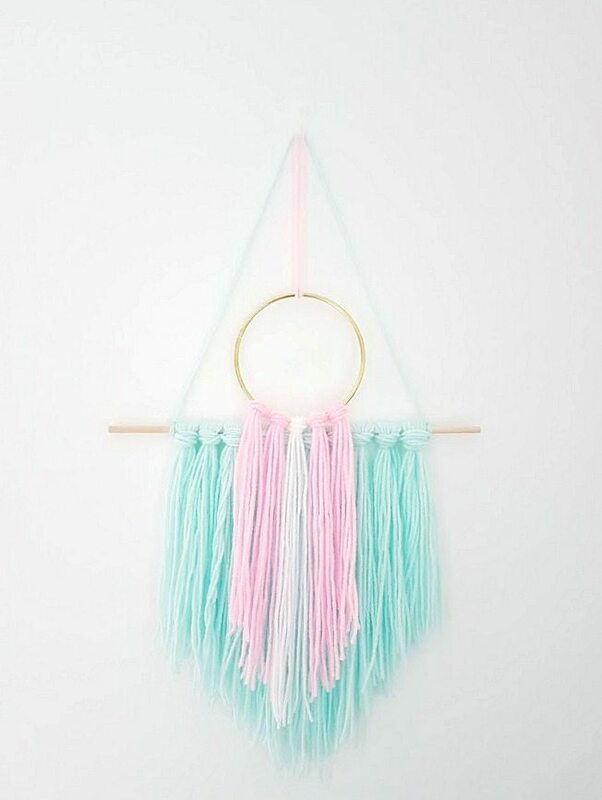 This is optional, but I love the way the rings add a fun dimension to the wall hangings. These are the brass rings I used. I made a few different versions of these hangings, so make sure you read all the way down to the bottom to check out the different options and embellishment ideas! Alright, let’s go through it, step by step. 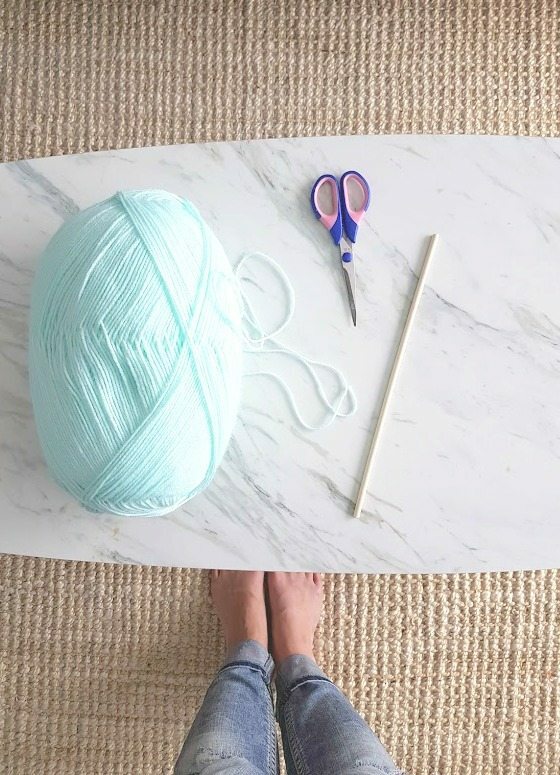 Have your dowel, your yarn out, and your scissors ready to go. 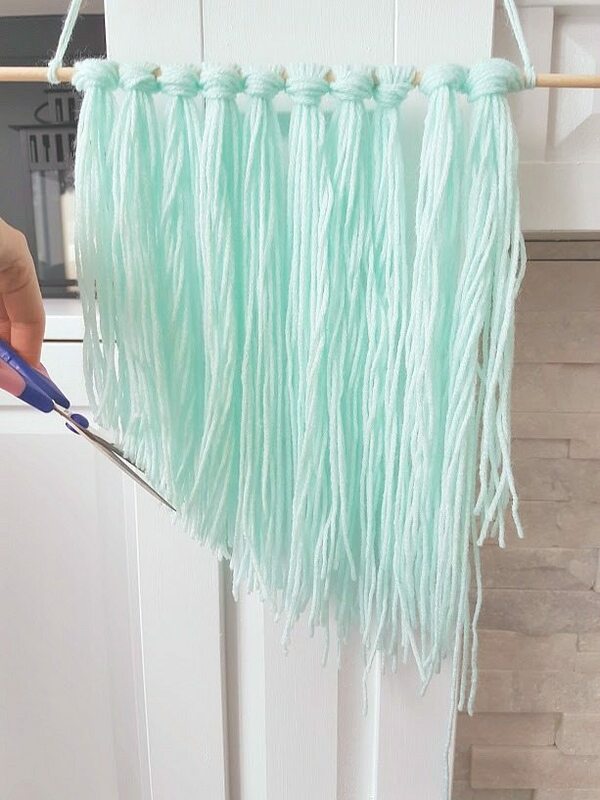 Here is some mint yarn if you want the same look as mine, or some chunky black yarn looks amazing too (I did about 5 different colours because I loved these hangings so much!). If you want that natural, boho look then this cream yarn would be perfect. Grab your yarn, hold the loose end in one hand, and start to wrap the skein around your arm. Do this loop 10 times (fewer if you have really thick yarn), and cut the string after your last loop around and put the skein down. Once you have that done, grab your scissors and snip the rest of the yarn that is wrapped around your hand. Basically, you end up with 10 pieces of yarn cut to the same length (but keep them folded in half for the next part). That chunk of yarn you just cut to size will make up your first yarn knot on your dowel. This step is a little tricky to write out, so it’s best to look at the photos here as you go. Basically you’re going to keep your yarn folded in half, and then set your dowel on top. 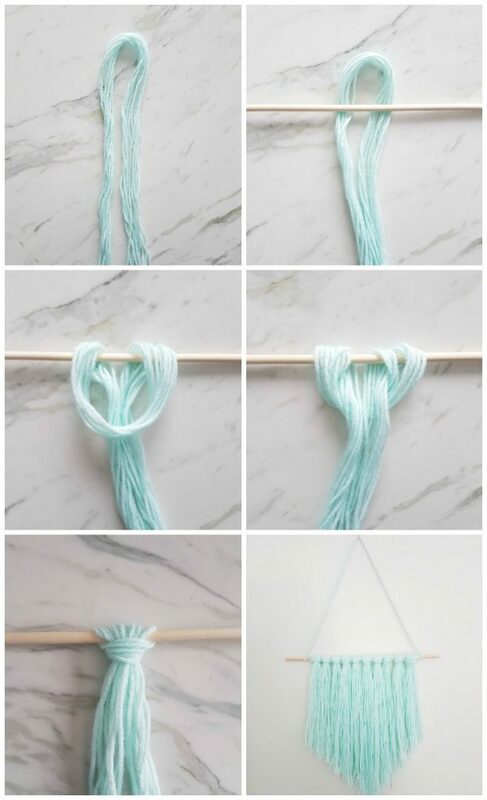 Pull the yarn ends through the top loop, pulling it down tight to create a knot. Do steps 3 and 4 as many times as you need to in order to fill up your dowel, leaving a bit of space on either side. If you are using thick yarn, you’ll need fewer knots. 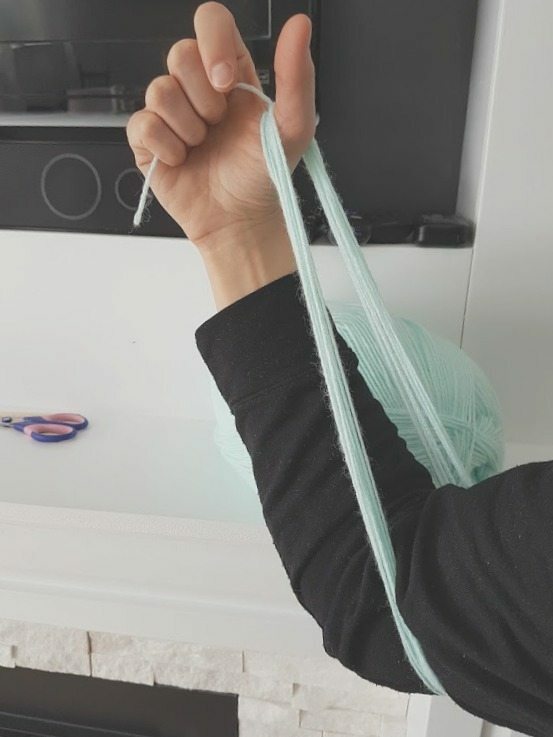 If you are using thinner stuff (like this mint yarn in my example), then you will have more knots. I had 10 in total for the mint DIY wall hanging. Now you need to take some of that yarn, cut a long piece, and tie it to either side of your dowel, leaving enough slack in the piece so that it can hang from it. I doubled up my yarn to be sure it was strong enough to hold. Now it’s the fun part. Hang up your new wall hanging, get out your scissors, and give that bad boy a haircut. I personally like the symmetry of having it be longer in the middle and shortening out to the sides. Find the middle knot (or two middle knots if you did an even number), then cut up from there. Don’t stress about it being perfect. Cut small amounts at first, and just even it out as you go. 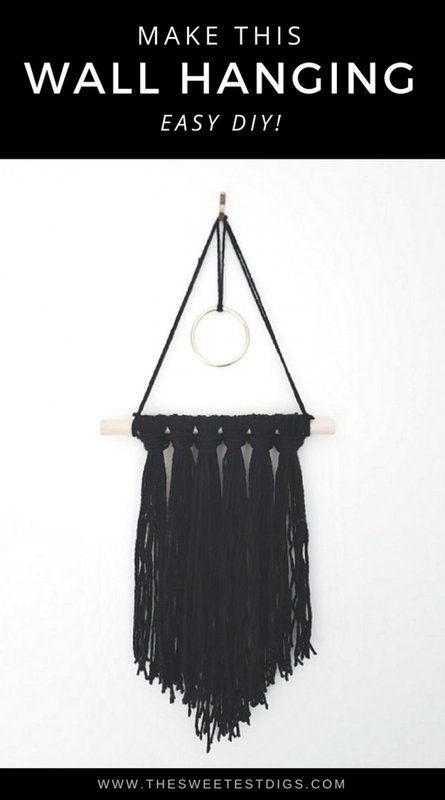 The fun thing about these wall hangings is that you can embellish them however you want. 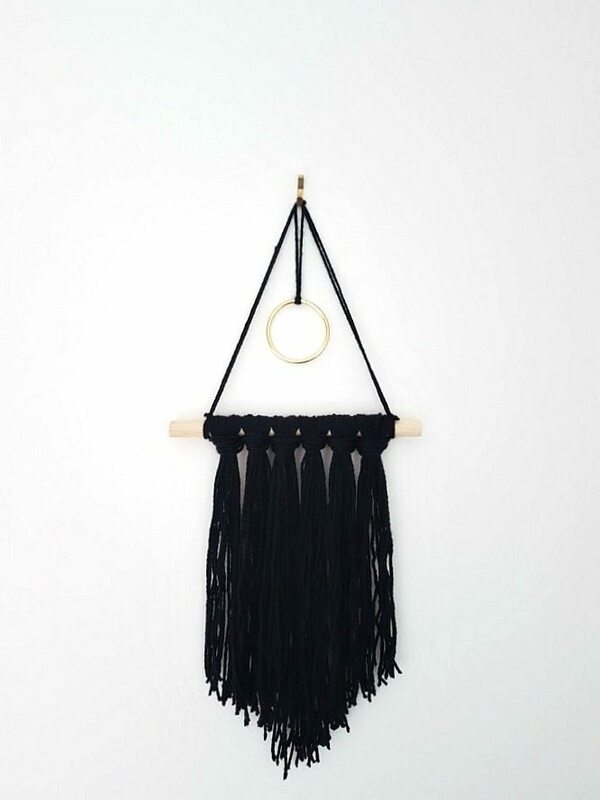 Or even make a mini DIY wall hanging on the brass ring and layer it on top of your original wall hanging. Fun, right? You can also braid some of your yarn, or add in little beads. It’s fun to really personalize them. I ended up making a bunch more of these, because they were so fun and easy to do! Want more projects like that? You might also like this painted driftwood hanger. 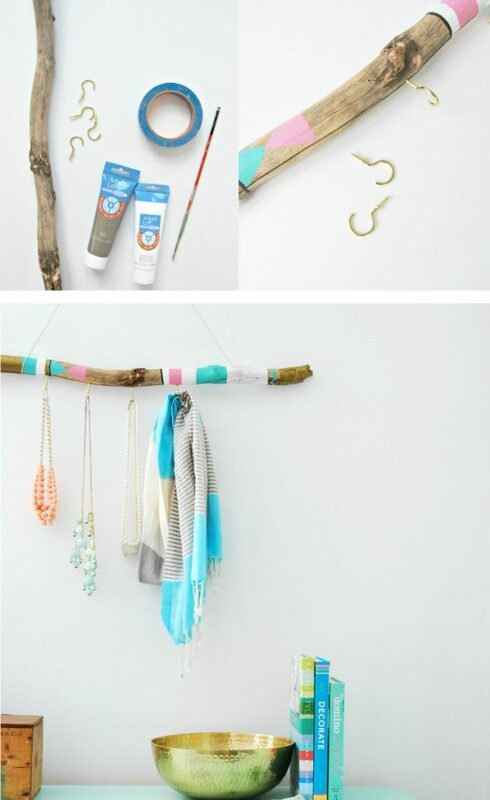 It’s a beautiful DIY project for hanging scarves or jewelry. 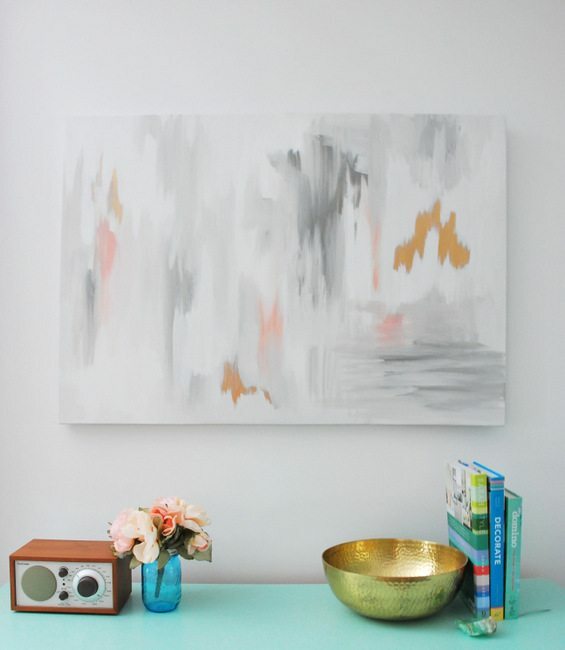 Or if you need some more art for your walls, this DIY abstract artwork is easy to do and adds so much impact to a room. 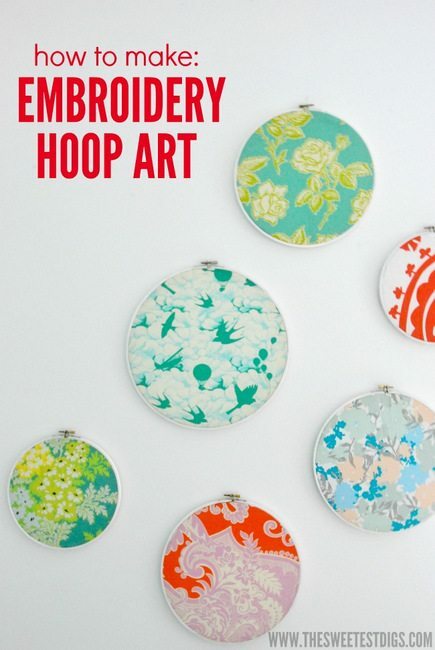 These DIY embroidery hoop art pieces are so fun too, and a great way to use some of your favourite fabrics! Something like a dream catcher.